Our emails were answered promptly! It was wonderful. We absolutely loved our time at Superior Reflections 2. Breathtaking view. Cute, clean, and cozy cabin. Perfect size for a couple and their dog. It was exactly what we had hoped for and we will definitely be back! The location was definitely ideal. Having games and puzzles available was a definite bonus. Loved the location!!! This was perfectly spaced near enough to the State Parks we visited and the LAKESIDE location was absolutely stunning! Sleeping to the crashing waves each night was heavenly. Only thing missing was a fly swatter :) Thank you for the water bottles - the water tasted terrible. The cabin is perfect, so well maintained. Cozy. Access to the beach great. We really liked it. Beautiful location. Loved listening to the waves crashing. Cabin was in excellent condition and we were so happy with everything about it. Would definitely come back! Cozy warm, clean and comfortable cotty. Awesome view of the lake. Privacy was perfect. All is perfect. My wife & I do a fall trip every year on the north shore for 3 nights. We like to move around and try different venues each trip. This find was indeed one of our favorite stays. We will return for sure. It was so warm and cozy during the early season gale winds/storm we encountered on 10/26-10/29/17. The view of the 6 to approx. 18 swells that Lk. Superior entertained us both indoors (only 15 or so feet from the water) & outdoors, as we traveled from Schroeder to Grand Marais to experience many locations of the show was spectacular. We found that right there in our own back yard was the best viewing along that path, along with Blue Fin Bays east side. We took many great action shots of the waves crashing into the shoreline. It was a perfect timing trip. The food at the many establishments in the area was very good as well. Some are not happy with the hard/salty water in cottage, but we found its such a small concern for all that it offers. The cold drinking water jug was used often and make that issue a nonissue. The lock box to check in and out was a great idea too. We had a great time and was so sorry to leave on Sunday morning. Try it, you will not be disappointed! Very responsive - much appreciated! This is the most wonderful place we've ever stayed - so close to the fantastic beach. Our friends stay in SR1 (we usually only see them once a year - on this annual trip in mid-September for our anniversary). We both have dogs, so we really appreciate that they are pet-friendly. Very easy to work with. Having the lock box is great. This was a little slice of paradise! The location to the beach was perfect. Very clean and well equipped. It was great that we could bring our dog, she loved it as well. Very nice. 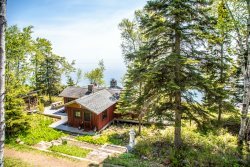 Close to Lake Superior and great view. The one time that I did have to directly communicate with an employee, they were very friendly and helpful. Very clean!!!! Cozy little cabin with a fantastic view!